Ka-Zar would have been a great addition to my post a few weeks back about superheroes I wish I liked more than I do. Not that I dislike him. He's just one of those Marvel guys who occasionally show up on the periphery of other books who I always want to see more of, but once I found myself at the comic shop I always forgot to dig through his back issues. Ben Morse's recent "Ka-Zar conundrum" essay reminded me of my curiosity regarding the lord of the Savage Land and it made me a little more impulsive than usual. As soon as I finished reading Morse's essay, I ordered Ka-Zar Vol. 1, the collection of Mark Waid and Andy Kubert's late '90s Ka-Zar series. Ka-Zar predictably begins in the vast jungle of the Savage Land beneath Antarctica, and just as predictably it ends in New York City. 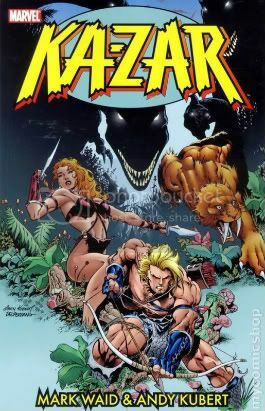 Ka-Zar and his wife Shanna are raising their newborn when a previously peaceful tribe of Savage Land natives attacks them with high-tech weaponry. The hunter arming the natives is Gregor, mentor of Kraven the Hunter. When Ka-Zar learns his brother Parnival is the one who hired Gregor; Ka-Zar, Shanna and the massive sabretooth tiger Zabu head to New York City for a reckoning. The trade ends with Ka-Zar and Shanna resolving some marital issues but Parnival's plans, which somehow involve an imprisoned Thanos, seem to only be beginning. In his essay, Morse addresses the question of whether or not Ka-Zar works as a character outside the jungle. Ka-Zar may be able to work in an urban setting, but I don't really want him to. One of the more obviously promising things about a Ka-Zar comic is that it offers a different setting than most superhero titles. The Savage Land is one of those Marvel settings everyone knows about but no one really knows. I think there's a lot of potential there and it's disappointing when issue #4 finds Ka-Zar already swinging the same rooftops as Spider-Man. And like it or not, there's something inherently goofy about a jungle hero in the city. Maybe there shouldn't be. Maybe you could argue that when Ka-Zar stampedes some mercenaries in space armor with a bunch of jungle animals he liberated from the zoo, it isn't any goofier than a superhero who got his powers from a spider bite or an old soldier dressed like a flag. But it seems a hell of a lot goofier. Regardless, I think the ambivalence I feel towards Ka-Zar has as much to do with my ambivalence toward Andy Kubert's art as it does my feelings on the story. Sometimes I really dig the dramatic postures, the crazy angles his characters move in relation to one another, and the exaggerated proportions. But there are a lot of times when I don't like it at all, and those instances really take me out of the story. There are a number of panels that stick out in my mind, particularly one from issue #4 where we see Shanna leaping in the air and her legs look like those of a short, fat man. Sometimes the crazy relation of one character to another make the scenes that much more dynamic, and sometimes it just makes it difficult to look at the page, as if I'm trying to solve a puzzle. I do like his renderings of the Savage Land's dinosaurs and its landscapes, which makes it that much more frustrating when the story moves to the city. I also think Kubert draws the most menacing version of the Rhino I've ever seen, which again makes it regrettable when the Rhino's second appearance in the title is drawn by a guest penciler. Overall Ka-Zar isn't a bad book but I don't have a lot of incentive to pick up subsequent trades. It has sparked enough remembered interest in the character that I feel the need to go hunt down the excellent Bruce Jones '80s issues. The next issues, to be collected if a Vol. 2 surfaces, finishes off "Urban Jungle," and then ventures into a semi-interesting three-parter featuring the High Evolutionary before Waid goes away and leaves the book in the hands of Christopher Priest, for whom the writing really was on the wall when he took over. Those last few issues aside, really that next volume will feature the creme de la creme of this run of Ka-Zar--which ain't saying much. Was Thanos really supposed to be a mystery villain? Really? At first glance it's not as goofy as any other super-hero concept, but Ka-Zar the jungle hero in the urban world of Marvel is a lot more inorganic and inherently goofy. This is because the world Ka-Zar inhabits in this trade is designed to fit around that concept of the man bitten by the radioactive spider and the World War II soldier given a serum to make him a super soldier. It is strange and goofy not just because it's Ka-Zar in New York, but it's Ka-Zar in Marvel New York. Here he isn't just a fish out of water, he's a freshwater fish in Ocean seawater. There's just no way he should be able to function, and trying to sell a story telling us otherwise just seems silly. Yes, Thanos was supposed to be the mystery villain, as confirmed by Waid himself in rec.arts.comics.marvel-universe back then on usenet. Christopher Priest's run started well, but basically it was already cancelled when Waid left -- a shame, as Priest had promised us GIANT Talking Pirate Robot Monkeys. The best Ka-Zar had ever been handled was in the 1980ties Ka-Zar the Savage series by Bruce Jones and Brent Anderson, which did stay largely in the Savage Land. I am te ultimate kazar and zabu fan. I have 4 seperate series of kazar and astonishing tales and the B and W savage tales. Cant wait for more savageland action. Kazar needs to stay out of NY.